Fun times watching the old mainstream media squirm as Jeff Bezos steps in to purchase the Washington Post, and begin the final turn from paper to digital – free online content, to paid. Make no mistake, good online content, at some point will cost YOU money to read online only. Or perhaps you will get a paragraph for free, followed by a click to the paid content (automatically debited a nickel or dime at a time. Let’s see … average 500 unique dimes a day here … awww, what would I do with an additional $20-thousand usd a year … take readers further, faster perhaps? Sounds like a good idea to me! As a re-forming journalist (as in; I am changing my shape and stripes), I have been caught up in the death of newspapers for about 23 years now, and the death throes of paper news continue, with most of the smaller spasms (from small dailies) just about done. With the beginning of change to large dailies the big TV networks take notice, examine their own navels and wonder if they are next to be bought by some internet mogul, some Mark Cuban type. Maybe so, but I think it will take a while longer. Where this site appears to have made its mark is by striving to bring you along for experiences, and leaving you with the knowledge that you need to do these fly fishing things we want to do. After about six years of providing unique content – images, words and video, there’s not another website that specifically talks about fly fishing in Texas that provides a greater volume of content, or ranks higher than Texas Fly Caster. I hope you all still enjoy the free content, continue reading, continue commenting and continue providing ideas about stories on Texas fly fishing. CLICK BELOW TO READ MORE! You’re gonna’ love it. As much as I would like to have invisible support, and run a formal non-profit Texas Fly Caster website, that’s just not in the cards for this site. While proceeds from the fly shop on strong at first, perhaps it was the format of the store, my lack of focus on promoting those products, or some other ghost in that machine, that leads me to believe there’s no reason to reopen the Fly Shop this fall. If you are still looking for something that I sold there – Coyote Carp Flies, unqiue jig hooks, kayak straps, or anything else – just contact me and I will dust it off, take payment and send it along to you – post haste. One way you can help improve the content you find at Texas Fly Caster, beside telling me what fly fishing, music and cultural content you need – doesn’t cost you a darn thing! All the ads on Texas Fly Caster are click through paid, or paid display ads. All you have to do is click on the ads when you are ready to buy something – ANYTHING – from the sites that advertise here. You’ll have a little “cookie” in your browser for 30-90 days that credits that click back to Texas Fly Caster for a commission. These cookies, are not fattening and harmless to your blood-sugar levels. This system reaches into Amazon as well, so click through the Amazon ads for your Amazon purchases as well. Like it or not, the ads are here to stay, and more are on the way. It’s a way for you to pay nothing for great content – every time you purchase something from these advertisers – and still finance ever improving content at Texas Fly Caster. Jack Bookout takes a break after we had several shots at carp, and one landed at this location. The wind made for difficult poling, and it was coming from the north yesterday morning. If the wind caught us, we would fly over the carp much like it happens going over reds on the coast. Once we found the calm, good, clean shots were there for the taking. This size skiff allows you to weave through the trees, and with the light weight, Jack can turn on a dime and give change. 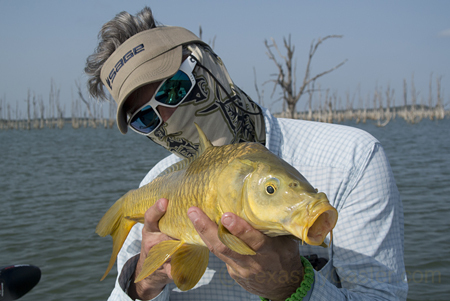 While my foray into adding a skiff to the arsenal has apparently stalled, I certainly appreciate Jack’s accommodating this adventure, and showing me just how good fly fishing for carp can be from a technical skiff like the Spear. 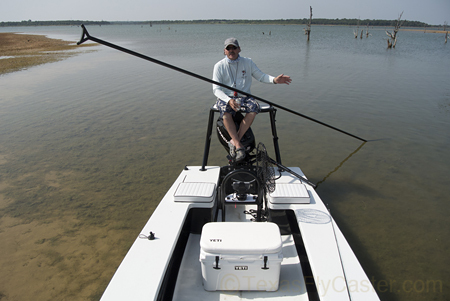 I am one step closer to being convinced that skiffs are the future of fly fishing for carp in Texas. Taking saltwater technology like a poling skiff, and putting it to work fly fishing for Texas freshwater carp? Now, feel free to correct me, but where else have you seen this story besides Texas Fly Caster? I would love to compare notes with anyone else doing this sort of fly fishing. Stay tuned, and click on those advertisers. Skiff Carp Number 1. What a beautiful fish to start the skiff journey, don’t you think? It may be a real long ride though.